Quality Air Heating and Air Conditioning > Articles > Indoor Air Quality > What Are UV Air Purifiers Used For? What Are UV Air Purifiers Used For? In most homes, homeowners can get away with basic air filters or advanced air filtration systems. However, removing pollutants from the air with air filters or electronic air purifiers is not always sufficient for boosting the indoor air quality in one’s home. This is the case when the problem within that home is the presence of biological pollutants, certainly. While dust and dirt can be effectively removed from the air, biological pollutants present further complications. Specialized equipment, such as UV air purifiers, may be used in order to resolve the issue. Read on, and let us know if you think that you’d benefit from the use of UV germicidal lights in Columbus, OH. What Sets UV Air Purifiers Apart? UV air purifiers do not trap pollutants the way that an air filter or electronic air cleaner would. In fact, they don’t trap pollutants at all! Instead, these systems destroy pollutants, including viruses, mold spores, and bacteria. Do you know what these biological pollutants share in common? They are all living organisms. The challenge of dealing with such pollutants lies largely in the fact that they are capable of reproduction. This is where UV germicidal lights come in handy. These systems use UV radiation — in amounts safe to humans and animals, and which is entirely restricted to the interior of your system — in order to destroy these pollutants. They are disrupted at the DNA level, and are rendered incapable of reproduction. These pollutants are often so small that the air filters generally used in residential applications wouldn’t filter them out of the air, anyway. Even if they did, the pollutants could continue to multiply. Using a pollutant-destruction based system is the best way in which to deal with these pollutants, which can cause aggravated allergy and asthma symptoms, as well as illness. 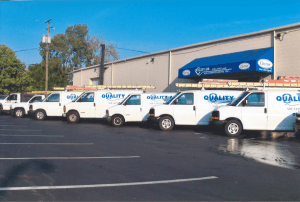 Contact Quality Air Heating and Air Conditioning today to schedule your IAQ services with trained professionals.